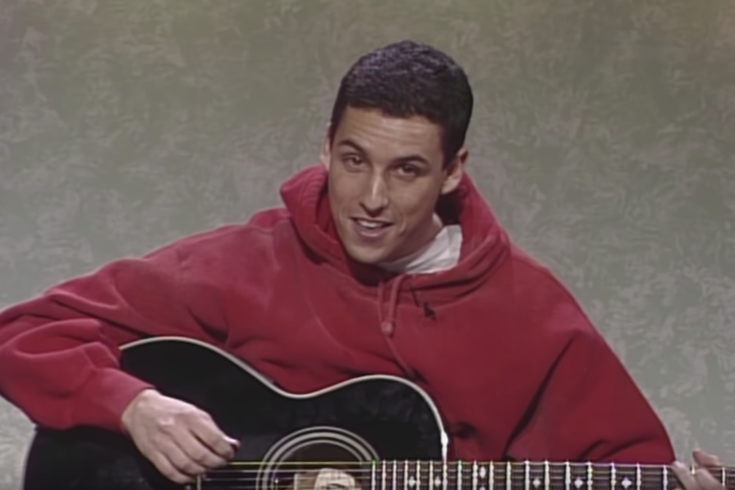 Adam Sandler performs a song about "Valentine's Day" on Weekend Update in 1993. "Saturday Night Live" has announced that former cast member Adam Sandler will be returning to host "SNL" for the first time in May. Sandler began his career on "SNL" in the 1990-91 season as a writer before moving into his role as a feature player in the 1991-92 season. He quickly became a beloved favorite with sketches like The Gap Girls and Opera Man. He was also known for acoustic performances of songs like, “Chanukah Song” and "Thanksgiving Song." This is the first time the "SNL" veteran will be hosting the show. While Sandler has made some appearances, like returning to give us a second Hanukkah song in 2002, the comedian had previously said he had no interest in hosting the show. He mentioned in an interview with Norm MacDonald on his video podcast, "Norm MacDonald Live," in 2014, "Why should I?" Sandler was fired after the 1994-95 season, which saw low ratings for the show. Cast mate Chris Farley was also let go in 1995. The next season would usher in a new era for "SNL" with Will Ferrell, Cherie Oteri, and Darrell Hammond. Sandler's Netflix special, "100% Fresh," was released in October of 2018. The comedy special has a 89 percent rating on Rotten Tomatoes. The actor will also be co-starring with Jennifer Anniston in "Murder Mystery," a film due out later this year on Netflix. Sandler will be returning to "Saturday Night Live" on May 4 with musical guest Shawn Mendes. This will be the singer's second performance, who originally performed in 2016 with Emma Stone as host. Until then, you can catch Kit Harington hosting this Saturday, April 6 at 11:30 p.m. on NBC.